- Milan Djurdjevic, Vladan Djurdjevic, Ceda Macura, Bane Jelic and Bily King. - The first concert was performed on 04.04.1993 in Belgrade. - The album "Neverne Bebe I" was recorded for Publishing House "Take it or Leave It". - Videos for this album were: "Veliki je bog " & "1000 godina"
- This crew gave 131 concerts; the last one was in Becej on 14.05.1994. - Debut in Podgorica on 21.05.1994. - In the middle of 1996, recording of the "Neverne Bebe II" album started. 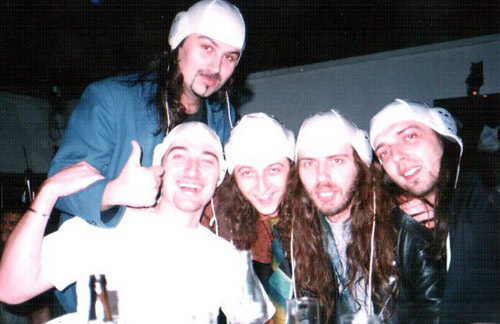 - With the concert number 470 in Kotor on 07.09.1996, this crew stopped with work. Bily King has left the group. Gorica Ponjavic & Alexandar Tasic became new members. - Recording for "Neverne Bebe II" had finished; at the beginning of 1997, it got published by "Red Line Records" from Munich as record No.1. - Videos for this album were: "Stranac", "Dvoje", "Divlje Svinje" & "Godine Srama"
- During 1998, the record number of concerts was achieved - 1471! - The song "Dvoje" has become a great hit and their trademark. - At the end of 1998, a new TV music quiz "3K-DUR" started broadcasting, and with breaks, it lasted until 2004; it had 3 seasons, and represented the band as amazing, especially Milan and Randa as magnificent musicians. Milan prepared some new songs, and as an amazing finish of that year they travelled to Africa and gave a New Years Eve millenium concert in Kenya. - In 2000, 142 concerts were performed and recording for the new CD began. - On 07.10.2000, following the October 5th "Revolution", "Neverne Bebe" ,together with the band "Smak", gave a large concert in front of 50,000 people; the reason for this event was the inauguration of new president of SRJ Dr. Vojislav Koštunica. - The album "Neverne Bebe III - Južno od Srece" got published by HI-FI Center in the middle of 2001. - Videos for this album were: "Ljubav", "Gotovo", "Balkan" & "U beznadju"
- On 25.02.2001, the band had a great celebration at a Club "OH Cinema"; it was their concert NO. 1 0 0 0! For the first time, the band presented a new concept of music with guests - a female string quartet. - On 19.06.2001 in the same club in Belgrade, a promotion for the new CD took place; it was the band's concert No. 1041. - In the summer of 2001, the band had a first Montenegro tour; it was a big success, thousands of people visited Podgorica, Nikšic, Kotor etc. - In 2002, there was a large breakthrough, and finally, they had their own concert in Belgrade. - On 31.03.2002, they had an astonishing concert in Bitef theatre. 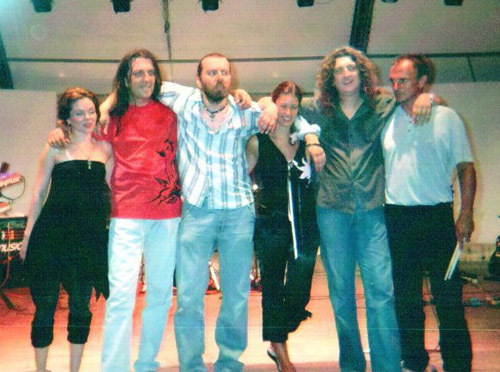 - On 03.07.2002, there was another fantastic, fully visited concert on summer stage of Gardoš in Zemun; the band presented its latest ideas in music, alltogether with many guests. Concert No. 1148! - On 04.08.2002, in Milan and Vlajko's hometown, Valjevo, the band had their greatest concert ever, and the idea for a LIVE album was born. 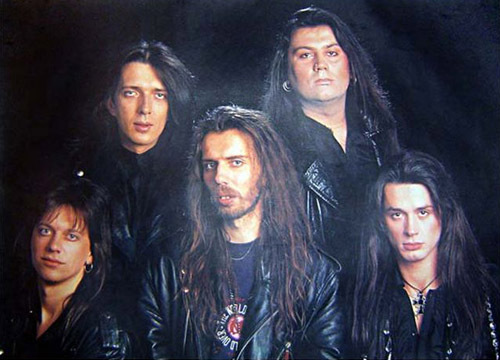 - At the start of 2003, Milan, Vlajko, and Randja wanted to do something new and different, but the rest of the band couldn't accept that, which caused the ideal and conceptual separation. - In May that year, the idea about changes in the band crew was created. - On 28.06.2003, this crew gave its last concert (NO. 1237), with the amazing result of 767 shows in six years!!! - The vocals Gorica & Tasa and the drummer Goran have left the band. - New members were welcomed - the vocals Jana & Jelena and the drummer Duca. - Summer to remember - fantastic reaction of audience, many concerts, totally new energy of the band and a big wish for recording a new CD. - Jana & Jelena gave a new tone, different color to the sound of the band, they made it special and it seemed that it was just the thing that Milan, Vlajko and Randja wanted through all these years. - The video for the song "Gde smo" which was taped in February, started broadcasting on BK television and rest of the media at the beginning of May . - In the same period, the CD - "Best of" was released by BK sound; it was at this moment that the audience had a chance to see, hear and feel this new sound of Neverne Bebe, and also somehow "notice" the new crew guided by the new vocals, and the rest of the tracks prepared in the last 10 months. - The summer of 2004, there was a promo of new CD, a really big tour lasted (excluding minor breaks) for two and a half years! Countless clubs, squares, stages, shows, cities, all passing by the speed of light. The main point of these concerts was great performance, a much larger audience, and amazing positive reaction to new crew members. - The new videos for the songs "Veliki je bog" &"Dabogda Lažem" were made in January of 2005, and they had a premiere the following month. - The video for "Tužna Pesma" was filmed in June 2005, and with it, the story of the CD "Best of" was completed in the best possible way. The song video was most shown, the tune was quite often on radio, and on live shows the audience waited for it with a special emotion. N.Bebe finally had a song that overshadowed even the legendary song "Dvoje". - The last change in crew happened at the end of 2005; Duca Ivaniševic was replaced by the new drummer Vladimir Ružicic - Kebac. - The work on a new CD "Neverne Bebe V" started in the middle of the concert tour - March 2006, and it was finished in April the following year - 2007. It only tells about the amount of will, hard work, energy and enthusiasm put in new songs and the whole project. - The video for the song "Da ima nas", created by the end of July 2006, represented the announcement of the new CD and its looks. The first broadcasting was done in September, and the song broke all records in the amount of time it took to become popular among listeners. It became a hit in a few days. - The historic event of being a guest intro band for TOTO concert on 15th of August on stadium "TAS" speaks for itself - any musician would agree that there is no greater honour and privilege (except maybe the one by the name of "Pink Floyd"... some of you will know what we mean). - In December of 2006, the band made video for the song "Boje Duge" which was the actual announcement about the new CD. It was shown for the first time in March of 2007 and immediately, it found place at the top of TV playlists all over ex-YU. - A new award was received at the end of 2006 - the song "Oktobar fest" was proclaimed as "The song of the year" by the votes of audience on TV Balkanmedia, in the show "Hitmetar". - On April 16th 2007. the fifth album "Neverne Bebe V - Iza Oblaka" was finally released and in stores. - Unbelievably, the album was sold out in the first month, it was the best selling R'N'R CD since 1990. - In the period of July 5th, 2004 to May 19th, 2007, the latest crew appeared on stage 388 times. - The song “Dvoje” from “Neverne Bebe II” (1997.) was claimed to be the best ballad in Serbia and Montenegro in the last 10 years, by the opinion of numerous radio and TV stations, and the surveys they had performed. - This song’s lyrics are placed in the book “TOP 50 best ex-YU lyrics” which put Milan Djurdjevic side by side to Dj. Balaševic, Dž. Štulic, G.Bregovic, D.Topic and all other great names in YU rock. - The crew change in 2003 speeded up work on new CD ”The best of”; its appearance made it best selling R’N’R album in region. - On “Suncane Skale” summer festival in July of 2004, the band was rewarded for it, making it best rock album in SiCG after only two months from the official release. - The two new vocals, ofcourse, take most of credits for new sound and energy in band. Number of calls doubled, so the band has big concert activity. - Jana Šušteršic – one of new singers, was born in Slovenia, and this fact will be quite helpful for breakthrough on the market there. Presenting work of N.Bebe in Slovenia is one of bands top priorities. - Latest CD “Iza oblaka” has a great possibility to break a selling record in the whole region, but the result will be seen in a year or two, judging by the present market data. - In order to promote the new CD, making at least 3 (or maybe more) new videos is planned; what is important is the fact that all songs have the same chance.